I am a fan of Faith Erin Hicks' graphic novels. I love her distinctive artwork. Whether she's working by herself or with others, I'm attracted to her work. 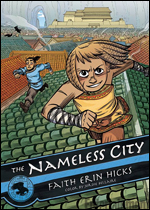 The Nameless City is her latest book, and my favorite to date. It's a historical fantasy about two young people, one a child of the conquerors and the other of the conquered. I love the powerful women in this story. I love that the name of the city--"The Nameless City"--is an attempt to give some power to the subjugated. I read this book over a month ago, and I'm sorry I didn't get a chance to write about it sooner. I would have had much more to say. I can tell you that this first volume of a trilogy reads well as a stand alone, but definitely leaves me glad there will be more.